The author of Women Who Kill, Next Time She’ll Be Dead, Looking for Lovedu, and other books about women and violence has as little use for George W. Bush as she has for the Taliban. 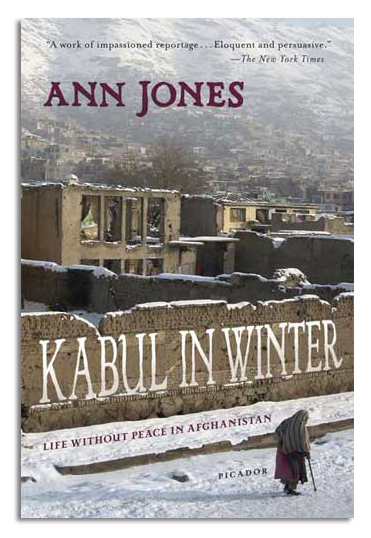 What took her for three years to the Hindu Kush and occupied Afghanistan-where, late in 2005, half the capital city is still in ruins and “children are kidnapped and sold into slavery or .murdered for their kidneys or their eyes”-was a kind of rage against waste and ruin, stupidity and deceit, misogyny and self-righteousness. In the wake of American bombs, she had to do something, even if only to instruct widows how to sew, weave, and embroider at home; or to collect the stories of females imprisoned for running away from arranged marriages and licensed rapists; or to train teachers and midwives; or to record for us the deadening jargon of international aid: “nexus concern,” “Indefinite Quantities Contract,” “multiplier effect,” and “maximizing outputs.” Not for Jones any cultural relativism that excuses throwing acid in the faces of unveiled coeds at the university and death by stoning for adultery; nor any willingness to rationalize a foreign-aid program that leaves eighty-six cents of every American dollar safely at home, while the remainder seems to end up with Halliburton or Creative Associates. And she is not a bit impressed by a brand-new democracy in which Karzai is “over-elected” president, with “a million more registered voters” than there are Afghan citizens. We meet many remarkable people in this angry, eloquent book, but none more remarkable than Jones herself. When she tells us that “Kabul in winter is the color of dust,” and that “dust fills the lungs, tightens the chest, lies in the eyes like gravel, so that you look out on this obscure drab landscape always through something like tears,” we know exactly who’s crying. But these are tears of rage.